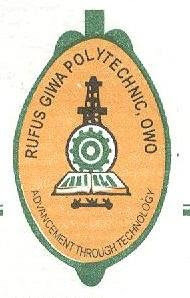 WE are using this platform to inform all the candidates who applied for admission into the Rufus Giwa Polytechnic, Owo during 2019 UTME conducted by the Joint Admissions and Matriculation Board (JAMB) and those who wrote the examination and now willing to secure admission into the Polytechnic that they should register on-line for screening exercise for 2019/2020 Academic Session admission. Applicants are also enjoined to note that only candidates that scored a minimum of 150 marks and above are qualified to apply for admission into the Institution for the 2019/20 academic year. Eligible applicants are advised to visit the college’s portal at (sf.rugipo.edu.ng) for further information and register with effect from 5th September, 2019. Meanwhile, the screening fee is two thousand naira (N2,000.00) only. The candidates are advised to print their admission screening forms and thereafter reprint the dates for their Post-UTME tests on or before 19th October, 2019. The Rufus Giwa Polytechnic Post UTME Screening exercise has been scheduled to take place between 17th and 20th October, 2018. According to the school management, the RUGIPO Post-UTME Screening test has been re-scheduled to hold between 24th Oct., and 26th October, 2019. NOTE: All registered prospective candidates are to re-print their registration slips as from Thursday, 19th October, 2017 to know their screening schedule. The sale and submission of RUGIPO Post utme screening form has been extended to 20th October 2019. Interested and eligible candidates can still obtain the form before the closing date! pls sir I collected d form today but just hearing that the admission list have been announced can I still make it??????? The RUGIPO Admission list for 2016/17 has not been released yet.